Ever since the 18th century, Mauritius has been enriched by inflows of people from Europe, Africa, India and China. The result, on the island today, is a harmonious mix of cultural and religious traditions (Christianity, Hinduism, Islam and Buddhism). The setting for all this human variety is a natural paradise. The landscape of Mauritius is breathtaking, with elegantly shaped mountain peaks and a variety of microclimates. The plant life is abundant; an abiding image is the jade mantel created by sugar cane, stirred from time to time by the trade winds. The visitor today finds white beaches and turquoise-blue lagoons encircled by coral reefs. This is a welcoming country, where the people live in a subtle relationship with the natural world around them. 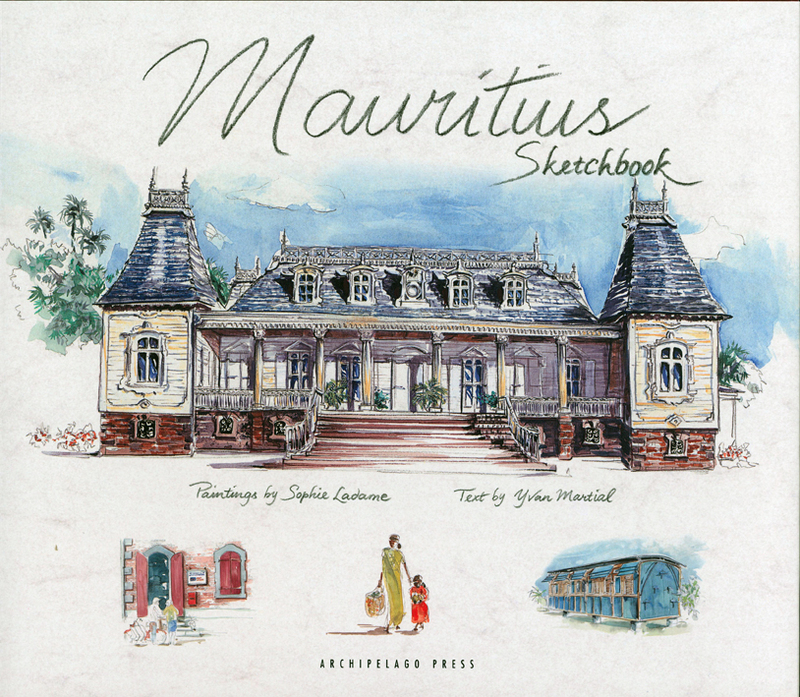 The watercolours in the book bear witness to a particular art of living, perfected in Mauritius. Inspired by family trips and voyages under sail in the Pacific and the Antilles, Sophie Ladame sketches the islands, and recycles pigments and papers to give a “local” feeling to her watercolours. Everyday life, places, and people encountered are her favourite topics, and feature in her first travel diary L’île de la Réunion published by Gallimard in October 2001. The Saint-Denis Natural History Museum of la Réunion mounted an exhibition of her watercolours in November 2001. Sophie Ladame was born in Paris in 1974. She studied the art of illustration at Axe Sud, Marseilles. She is now based in Paris and works for a number of international press and advertising agencies. Yvan Martial, born in Vacoas, Mauritius, in 1942, has an inextinguishable love for his native island, small but richly diverse, a melting point of three continents (Asia, Africa and Europe) and three major cultures (Hinduism, Christianity and Islam). He combines a passion for local history with work as a journalist. Formerly editor-in-chief of L’Express, Martial contributes to various Mauritian and Parisian weeklies. Since May 1997, he has published a Répertoire de la Presse Mauricienne which catalogues, summarises and alphabetically indexes about 4,000 pieces of local information every month. He also manages La Gazette des îles de la mer des Indes, a magazine dedicated to the history of Mauritius. He has also participated in several collective works.